The creation of a second set of premises for the University of Brighton’s University Centre Hastings (UCH) has taken a major step forward: site demolition has been completed and construction has begun. This marks a significant milestone for higher education in the area, with the new facility scheduled to be ready for the start of the September 2011 academic year. Demolition of the poor quality, 1960s rear extension to Hastings’ Post Office has been carried out since February to make way for the new university scheme. With the final piece of the extension dismantled, McLaren Construction has now taken over as the main contractor to build the new facility. The second UCH facility will be an impressive, twenty-first century learning environment. It will more than double the capacity of the University Centre — whose existing premises are now full — to over 1,000 student places. Over 800 of these places are already confirmed and funded. The project is managed by Sea Space, the company set up by the South East England Development Agency (SEEDA) and its partners to deliver economic development in the Hastings area. To support the area’s business community, the new facility will enable the expansion of UCH courses as well as the student population. It will incorporate a suite of laboratories and place a particular emphasis on science. New degrees will be provided in environmental biology, human biology, maths, computing, digital games production and broadcast journalism. The development scheme involves the renovation and extension of the 1930s Post Office building in Hastings’ Priory Quarter education and business district. 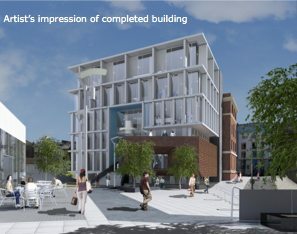 The new six-floor, 3,770m2 University Centre building will have its main entrance from the town’s recently created Priory Square. It will complete the enclosure of this public space by adding an impressive civic façade on the south side, complementing the One Priory Square offices on the north side and a new restaurant to the east. The Post Office will remain unchanged, in full operation on the ground floor of the building. The architecturally-notable façade will be cleaned and repaired. To create the new teaching premises, the vacant upper floors will be renovated and high quality new construction will replace the demolished rear extension, forming three sides around a central atrium. Illustrations are available. The project is backed by funding from the South East England Development Agency (SEEDA), the University of Brighton — supported by the Higher Education Funding Council for England (HEFCE) — and bank financing. Hastings’ main Post Office building, in the heart of the town’s central conservation area, was identified during early planning for the creation of Priory Quarter as having good potential for educational use. Sea Space has worked with architects Proctor & Matthews to create designs which protect the building’s heritage and maximise its potential, while restoring the historic streetscape and maintaining the Post Office in full operation. TK Associates (www.tk-associates.com) on tariq.khwaja@tk-associates.com or 07833 336 271.